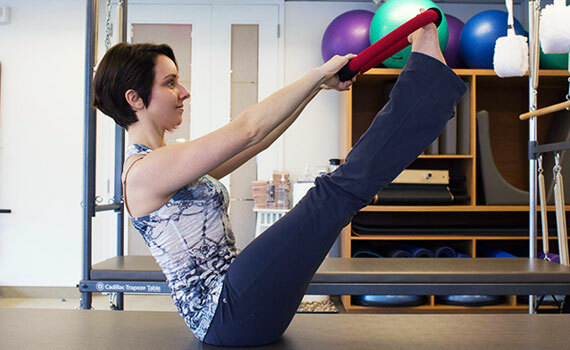 Lead Instructor Trainer Bianca Bolissian demonstrates how to use the Toning Ring to assist in supporting the weight of the legs and keeping the balance off the sit bones. 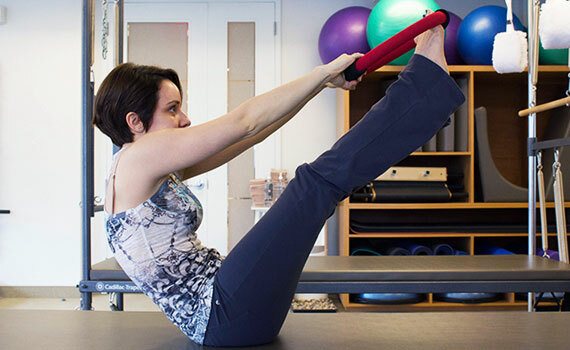 The flexible Toning Ring is taut enough to help support the legs but has enough give to allow pull-back for the retractor connection and for shorter arm length. Answer: Photo B. Seated off the sit bones, the lumbar region is flexed, the thoracic spine is lengthened, legs are long and the scapulae are stabilized. In Photo A, the thoracic is in hyperflexion, shoulders are elevated, the scapulae are overly protracted and knees are bent.